For the community in the U.S. state of Texas, see Close City, Texas. A closed city or closed town is a settlement where travel or residency restrictions are applied so that specific authorization is required to visit or remain overnight. They may be sensitive military establishments or secret research installations that require much more space or freedom than is available in a conventional military base. There may also be a wider variety of permanent residents including close family members of workers or trusted traders who are not directly connected with its clandestine purposes. Many closed cities existed in the Soviet Union. After 1991, a number of them still existed in the CIS countries, especially Russia. In modern Russia, such places are officially known as "closed administrative-territorial formations" (закрытые административно-территориальные образования, zakrytye administrativno-territorial'nye obrazovaniya, or ЗАТО ZATO for short). Sometimes closed cities may only be represented on classified maps that are not available to the general public. In some cases there may be no road signs or directions to closed cities, and they are usually omitted from railroad time tables and bus routes. Sometimes closed cities may be indicated obliquely as a nearby insignificant village, with the name of the stop serving the closed city made equivocal or misleading. For mail delivery, a closed city is usually named as the nearest large city and a special postcode e.g. Arzamas‑16, Chelyabinsk‑65. The actual settlement can be rather distant from its namesakes; for instance, Sarov, designated Arzamas-16, is in the federal republic of Mordovia, whereas Arzamas is in the Nizhny Novgorod Oblast (roughly 75 kilometres (47 mi) away). People not living in a closed city were subject to document checks and security checkpoints, and explicit permission was required for them to visit. To relocate to a closed city, one would need security clearance by the organization running it, such as the KGB in Soviet closed cities. Closed cities were sometimes guarded by a security perimeter with barbed wire and towers. The very fact of such a city's existence was often classified, and residents were expected not to divulge their place of residence to outsiders. This lack of freedom was often compensated by better housing conditions and a better choice of goods in retail trade than elsewhere in the country. Also, in the Soviet Union, people working with classified information received a salary bonus. Closed cities were established in the Soviet Union from the late 1940s onwards under the euphemistic name of "post boxes", referring to the practice of addressing post to them via mail boxes in other cities. They fell into two distinct categories. The first category comprised relatively small communities with sensitive military, industrial, or scientific facilities, such as arms plants or nuclear research sites. 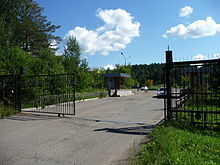 Examples are the modern towns of Ozyorsk (Chelyabinsk-65) with a plutonium production plant, and Sillamäe, the site of a uranium enrichment facility. Even Soviet citizens were not allowed access to these places without proper authorization. In addition to this, some bigger cities were closed for unauthorized access to foreigners, while they were freely accessible to Soviet citizens. These included cities like Perm, a center for Soviet tank production, and Vladivostok, the headquarters and primary base of the Soviet Pacific Fleet. 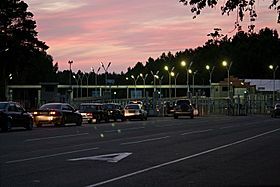 The second category consisted of border cities (and some whole border areas, such as the Kaliningrad Oblast, Saaremaa, and Hiiumaa), which were closed for security purposes. Comparable closed areas existed elsewhere in the Eastern bloc; a substantial area along the inner German border and the border between West Germany and Czechoslovakia was placed under similar restrictions (although by the 1970s foreigners could cross the latter by train). Citizens were required to have special permits to enter such areas. The locations of the first category of the closed cities were chosen for their geographical characteristics. They were often established in remote places situated deep in the Urals and Siberia, out of reach of enemy bombers. They were built close to rivers and lakes that were used to provide the large amounts of water needed for heavy industry and nuclear technology. Existing civilian settlements in the vicinity were often used as sources of construction labour. Although the closure of cities originated as a strictly temporary measure that was to be normalized under more favorable conditions, in practice the closed cities took on a life of their own and became a notable institutional feature of the Soviet system. Movement to and from closed areas was tightly controlled. Foreigners were prohibited from entering them and local citizens were under stringent restrictions. They had to have special permission to travel there or leave, and anyone seeking residency was required to undergo vetting by the NKVD and its successor agencies. Access to some closed cities was physically enforced by surrounding them with barbed wire fences monitored by armed guards. "Box" was the unofficial name of a secret Soviet facility much like the closed city, but smaller, usually the size of a factory. The "box" name was usually classified, as were the activities there. Incoming mail was addressed to "mailbox #XXXX", thus the name of "box". Most Soviet design bureaus for weapons, aircraft, space technology, military electronics, etc. were "boxes". A view of Severomorsk, Murmansk Oblast, Russia, which is home to the Northern Fleet. Russia has the largest number of closed cities. The policy of closing cities underwent major changes in the late 1980s and early 1990s. Some cities, such as Perm, were opened well before the fall of the Soviet Union; others, such as Kaliningrad and Vladivostok, remained closed until as late as 1992. 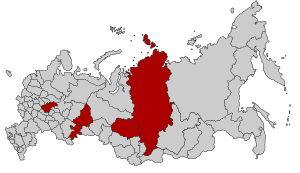 The adoption of a new constitution for the Russian Federation in 1993 prompted significant reforms to the status of closed cities, which were renamed "closed administrative-territorial formations" (or ZATO, after the Russian acronym). Municipally all such entities have a status of urban okrugs, as mandated by the federal law. There are currently 44 publicly acknowledged closed cities in Russia with a total population of about 1.5 million people. 75% are administered by the Russian Ministry of Defense, with the rest being administered by Rosatom. Another 15 or so closed cities are believed to exist, but their names and locations have not been publicly disclosed by the Russian government. Some Russian closed cities are open for foreign investment, but foreigners may only enter with a permit. An example is the Nuclear Cities Initiative (NCI), a joint effort of the United States National Nuclear Security Administration and Minatom, which involves in part the cities of Sarov, Snezhinsk, and Zheleznogorsk. The number of closed cities has been significantly reduced since the mid-1990s. However, on 30 October 2001, foreign travel (without any exceptions) was restricted in the northern cities of Norilsk, Talnakh, Kayerkan, Dudinka, and Igarka. Russian and Belarusian citizens visiting these cities are not required to have any permits, however, local courts are known to deport Belarusian citizens in contradiction with the federal Constitution. Krasnoyarsk-26 in Siberia, researched for the subject of Sidney Sheldon's 2001 fictional murder mystery-romance The Sky is Falling, was planned in 2003 to be shut down by 2011, in co-operation with the U.S, and documented by their Natural Resources Defense Council, but actually closed in 2008. The number of closed cities in Russia is defined by government decree (see links further). They include the following cities. Reasons for restrictions are denoted in the descriptions below. Vilyuchinsk - base of a squadron of submarines from the Russian Pacific Fleet, also involved in the production of nuclear submarines. Ozyorsk – nuclear waste processing and recycling plant. It was known as Chelyabinsk-65, and before that as Chelyabinsk-40 (the digits are the last digits of the postal code, and the name is that of the nearest big city, which was a common practice of giving names to closed towns). Nizhny Novgorod, Nizhny Novgorod Oblast. Nizhny Novgorod was previously named Gorky. There is a list of territories within Russia that do not have closed city status, but require special permits for foreigners to visit. 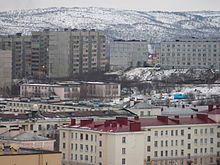 The largest locality within such territory is the city of Norilsk. There were two closed cities in Estonia: Sillamäe and Paldiski. As with all the other industrial cities, the population of them was mainly Russian-speaking. Sillamäe was the site for a chemical factory that produced fuel rods and nuclear materials for the Soviet nuclear power plants and nuclear weapon facilities, while Paldiski was home to a Soviet Navy nuclear submarine training centre. Sillamäe was closed until Estonia regained its independence in 1991; Paldiski remained closed until 1994, when the last Russian warship left. Tartu, home to Raadi Airfield, was partially closed. Foreign academics could visit the University of Tartu, but had to sleep elsewhere. Baikonur, a town close to the spaceport facility of the same name in Kazakhstan, which is rented and administered by Russia. Non-resident visitors will need pre-approval from the Russian authorities to visit both the town of Baikonur itself and the Cosmodrome. Note that said approval is completely separate from just having a Russian visa. Some tourism organisations in Kazakhstan provide services in organising trips to visit Baikonur and the museums contained there. Kurchatov, Kazakhstan – was previously known by its postal code, Semipalatinsk-16. Moldova has one official closed city – the commune Cobasna (Rîbnița District) in the disputed area of Transnistria. The commune, located on the left bank of the Dniester river, still contains military warehouses of the former Soviet 14th Army. Ukraine had eighteen closed cities: among them the Crimean port of Sevastopol and the industrial city of Dnipropetrovsk, though both were restricted to foreigners, not locals. Travel restrictions were lifted in the mid-1990s. Simferopol-28, Crimea – former closed town, a Soviet military space mission control center. Feodosia-13, Crimea – former closed town, a central storage of nuclear weapons. During the period of communist rule in Albania, the towns of Çorovodë and Qyteti Stalin (now Kuçovë) were closed cities with a military airport, military industry and other critical war infrastructure. No.404 Factory of China National Nuclear Corporation (中国核工业总公司第四零四厂), then the Ministry of Nuclear Industry, located in the Gobi desert in western part of Gansu province. It is simply called the nuclear town (核城). It is the biggest nuclear industry base in China, built in 1958. China built its first military nuclear reactor and 80% of core parts for China's nuclear bombs were produced here. Before the 1980s, the whole town was closed from outsiders. A nuclear accident happened in 1969, which caused a leak of nuclear material. It was called the mine area of Gansu (甘肃矿区) outside to keep secret. In 2007, most of its residents were moved to nearby Jiayuguan City. Some remote areas in China, such as Datong Hui and Tu Autonomous County (except Laoye Mountain), Huangzhong County (except Kumbum Monastery), and Huangyuan County around Xining, the capital of Qinghai Province, maintain travel restrictions on foreigners. A foreigner has to apply for an alien travel document (外国人旅行证) in advance, and has to report their accommodation to local police within 24 hours after entering the area. Otherwise visitors would be requested to leave immediately. In Baja California, the communities on Guadalupe Island (such as Campo Oeste) can be considered closed towns; because Guadalupe Island is located in a Biosphere Reserve, the Mexican government requires special permits in order to visit the island. Mecca is closed to everyone not considered a Muslim by the Saudi authorities, including members of the Ahmadiyya movement. Similar restrictions are in place for the city center of Medina. Alexander Bay, Northern Cape. After diamonds were discovered along this coast in 1925 by Dr Hans Merensky, Alexander Bay became known for its mining activities. The town was a high security area and permits were needed when entered. Today, it is no longer a high security area and no permits are needed. ^ "City border". Photoarchives. FOTOESCAPE. Retrieved 2013-03-16. ^ "Secret Cities". GlobalSecurity.org. Accessed August 2011. ^ Victor Zaslavsky, "Ethnic group divided: social stratification and nationality policy in the Soviet Union", p. 224, in Peter Joseph Potichnyj, The Soviet Union: Party and Society, Cambridge University Press, 1988. ISBN 0-521-34460-3. ^ John Pike. "Krasnoyarsk-26". Retrieved 14 January 2015. ^ "Russia closes Soviet-era weapons grade reactor". Reuters. Retrieved 14 January 2015. ^ a b c d e f g Kassenova, Togzhan (2007). From Antagonism to Partnership: The Uneasy Path of the U.S.-Russian Cooperative Threat Reduction. Columbia University Press. p. 244. ISBN 3898217078. ^ a b c d e f g h i Sokova, Elena (June 1, 2002). "Russia's Ten Nuclear Cities". Nuclear Threat Initiative. Retrieved 13 January 2015. ^ a b c Gray, Nathan (April 15, 2013). "Investment questions for Russia's closed cities". The Moscow News. Archived from the original on 5 July 2014. Retrieved 13 January 2015. ^ Zhigulsky, Anton (October 25, 1995). "Former Closed Cities Host International Fair". The Moscow Times. Retrieved 13 January 2015. ^ Chuen, Cristina Hansell (May 24, 2007). "Russian Nuclear-Powered Submarine Dismantlement and Related Activities: A Critique". James Martin Center for Nonproliferation Studies. Retrieved 14 January 2015. ^ Nemtsova, Anna. "Secret Cities Revealed". The Washington Post. Retrieved 13 January 2015. ^ Mangione, Giulia (June 16, 2014). "Zarechny: a rare glimpse into one of Russia's last closed cities". The Guardian. Retrieved 13 January 2015. ^ a b Stewart, Will (December 6, 2009). "Were Russian security services behind the leak of 'Climategate' emails?". Daily Mail. Retrieved 13 January 2015. ^ Jones, Finn-Olaf (July 22, 2011). "A Bilbao on Siberia's Edge?". The New York Times. Retrieved 14 January 2015. ^ Potts, Andy (January 29, 2009). "Go green, young man". The Moscow News. Retrieved 14 January 2015. ^ "Постановление Правительства РФ от 4 июля 1992 г. N 470 "Об утверждении Перечня территорий Российской Федерации с регламентированным посещением для иностранных граждан" (с изменениями и дополнениями)". GARANT. ^ Wofford, Taylor (September 28, 2014). "A Look Inside the 'Closed Cities,' the Radioactive Ruins on Russia's Border With Kazakhstan". Newsweek. Retrieved 13 January 2015. ^ Slobig, Zaxhary (October 15, 2014). "Photos: The Ruins of the USSR's Secret Nuclear Cities". Wired. Retrieved 13 January 2015. ^ "China Boasts Breakthrough In Nuclear Technology". The Weekly Voice. 7 January 2011. Retrieved 31 December 2015. ^ 李杨 (3 February 2015). "404：与世隔绝的核城往事". GEO杂志. Retrieved 31 December 2015. ^ 吴廷桢，郭厚安主编 (1996). 河西开发史研究. 甘肃教育出版社. pp. 617–619. ISBN 7-5423-0675-8. ^ 环保部西北核与辐射安全监督站驻四〇四厂监督点调研团. "静静地守候 默默地奉献" (25 September 2013). 中央国家机关团工委2013年“根在基层·中国梦”（美丽中国）调研实践活动. Retrieved 31 December 2015. ^ "我在404长大" [Growing up in 404] (in Chinese). Zhihu. July 2016. Retrieved 18 December 2016. ^ 施翔、苏丽 (5 August 2013). "未办手续进入限制区域 6名外国人被责令离开". 青海法制报. Retrieved 31 December 2015. ^ http://islas.org.mx/index.php?mod=proy&op=islagua Islas.org.mx. Conservación de Islas. Isla Guadalupe. Retrieved August 17, 2018. ^ http://sdsharkdiving.com/isla-guadalupe/ Sdsharkdiving.com/isla-guadalupe. San Diego Shark Diving. Isla Guadalupe White Shark Trip - FAQs. Retrieved August 17, 2018. ^ http://www.squalodivers.com/guadalupe-island-giants-fortress/ Squalo Divers. Guadalupe Island, Giant Fortress. March 27, 2017. Retrieved August 17, 2018. ^ Peters, Francis E. (1994). The Hajj: The Muslim Pilgrimage to Mecca and the Holy Places. Princeton University Press. p. 206. ISBN 0-691-02619-X. ^ "Tighter Security Checks for Visitors". Dugway Proving Ground/United States Army. March 2, 2016. Retrieved November 10, 2017. ^ "DPG Visitors Guide" (pdf). United States Army, Dugway Proving Ground. p. 9. Retrieved November 10, 2017. Bukharin, Oleg (September/October 1998). "Retooling Russia's Nuclear Cities". The Bulletin of the Atomic Scientists – Educational Foundation for Nuclear Science. Feshbach, Murray (July 18, 1993). "The Secret And Dangerous Life In Russia's Forbidden Cities". The Seattle Times. Retrieved 13 January 2015. Sneider, Daniel (February 4, 1992). "Visit to 'Closed' City Brings Quick Celebrity". The Christian Science Monitor. Retrieved 13 January 2015. Wikimedia Commons has media related to Closed cities. Look up closed city in Wiktionary, the free dictionary. (in Russian) Current list of (acknowledged) closed cities / areas, from the Russian Federation Administration website. National Nuclear Security Administration, U.S. Department of Energy website. "Secret Cities" (article), from www.globalsecurity.org. * Right to the city in former Soviet Union closed cities (ZATO). Andrius Ropolas's paper focusing upon the social aspects of closed cites. Helpful bibliography. Secret / Closed cities in Google Earth.